LINE PLAN offers a full range of functional, slip-resistant tapes suitable for industrial applications in dry, wet or oily conditions. LINE PLAN offers a superior system for floor markings, line markings and pictograms that spectacularly surpasses all other marking systems on the market. 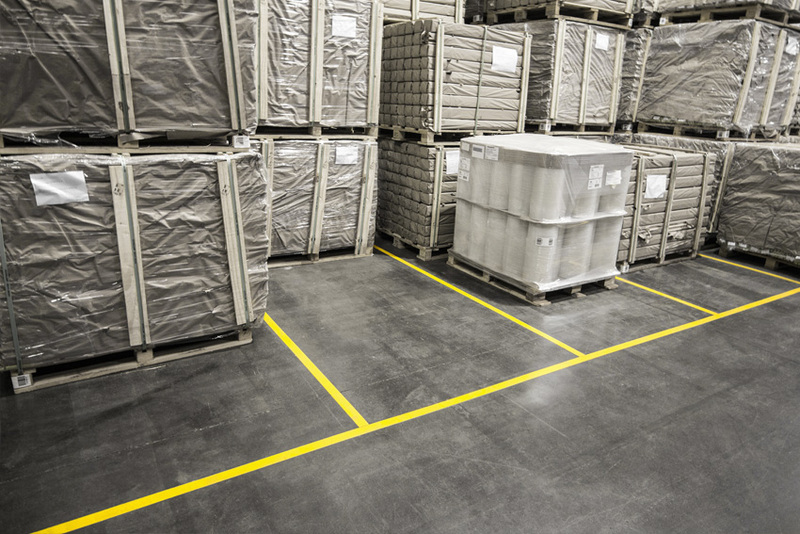 While the floor tape used in most alternative floor marking systems tears loose at the slightest abrupt manoeuvre with a forklift, or even if people scuff their feet over it, LINE PLAN provides unparalleled resistance to any kind of friction, but also all types of external influence. LINE PLAN floor markings give you a sharply demarcated, safe work environment that will give your company that professional look, while at the same time protecting your employees. The LINE PLAN floor markings and line markings are suitable for every type of surface and use, including concrete floors, footpaths, hallways, work zones, traffic zones, warehouse floors, etc. LINE PLAN not only provides line markings for your floors, but also offers a complete range of adhesive-backed pictograms in various sizes and versions. Our range of adhesive-backed pictograms includes all prevailing international safety and warning signs used in industrial and business settings. Within the LINE PLAN floor marking series, we offer a variety of strips in distinctive colours, both on rolls and as single adhesive elements.